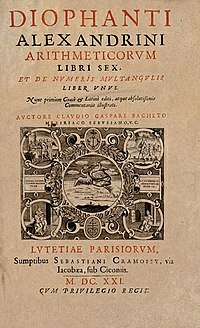 Teetle page o the 1621 edeetion o Diophantus' Arithmetica, translatit intae Laitin bi Claude Gaspard Bachet de Méziriac. Diophantus o Alexandria (Auncient Greek: Διόφαντος ὁ Ἀλεξανδρεύς; born probably sometime atween AD 201 an 215; died aged 84, probably sometime atween AD 285 an 299), whiles cried "the faither o algebra", wis an Alexandrian Greek mathematician an the author o a series o beuks cried Arithmetica, mony o which are nou lost. ↑ Research Machines plc. (2004). The Hutchinson dictionary of scientific biography. Abingdon, Oxon: Helicon Publishing. p. 312. Diophantus (lived c. A.D. 270-280) Greek mathematician who, in solving linear mathematical problems, developed an early form of algebra. ↑ Boyer, Carl B. (1991). "Revival and Decline of Greek Mathematics". A History of Mathematics (Second ed.). John Wiley & Sons, Inc. p. 178. ISBN 0-471-54397-7. At the beginning of this period, also known as the Later Alexandrian Age, we find the leading Greek algebraist, Diophantus of Alexandria, and toward its close there appeared the last significant Greek geometer, Pappus of Alexandria. ↑ Cooke, Roger (1997). "The Nature of Mathematics". The History of Mathematics: A Brief Course. Wiley-Interscience. p. 7. ISBN 0-471-18082-3. Some enlargement in the sphere in which symbols were used occurred in the writings of the third-century Greek mathematician Diophantus of Alexandria, but the same defect was present as in the case of Akkadians. ↑ Victor J. Katz (1998). A History of Mathematics: An Introduction, p. 184. Addison Wesley, ISBN 0-321-01618-1. "But what we really want to know is to what extent the Alexandrian mathematicians of the period from the first to the fifth centuries C.E. were Greek. Certainly, all of them wrote in Greek and were part of the Greek intellectual community of Alexandria. And most modern studies conclude that the Greek community coexisted [...] So should we assume that Ptolemy and Diophantus, Pappus and Hypatia were ethnically Greek, that their ancestors had come from Greece at some point in the past but had remained effectively isolated from the Egyptians? It is, of course, impossible to answer this question definitively. But research in papyri dating from the early centuries of the common era demonstrates that a significant amount of intermarriage took place between the Greek and Egyptian communities [...] And it is known that Greek marriage contracts increasingly came to resemble Egyptian ones. In addition, even from the founding of Alexandria, small numbers of Egyptians were admitted to the privileged classes in the city to fulfill numerous civic roles. Of course, it was essential in such cases for the Egyptians to become "Hellenized," to adopt Greek habits and the Greek language. Given that the Alexandrian mathematicians mentioned here were active several hundred years after the founding of the city, it would seem at least equally possible that they were ethnically Egyptian as that they remained ethnically Greek. In any case, it is unreasonable to portray them with purely European features when no physical descriptions exist." This page wis last eeditit on 14 Februar 2018, at 23:40.